Good morning. 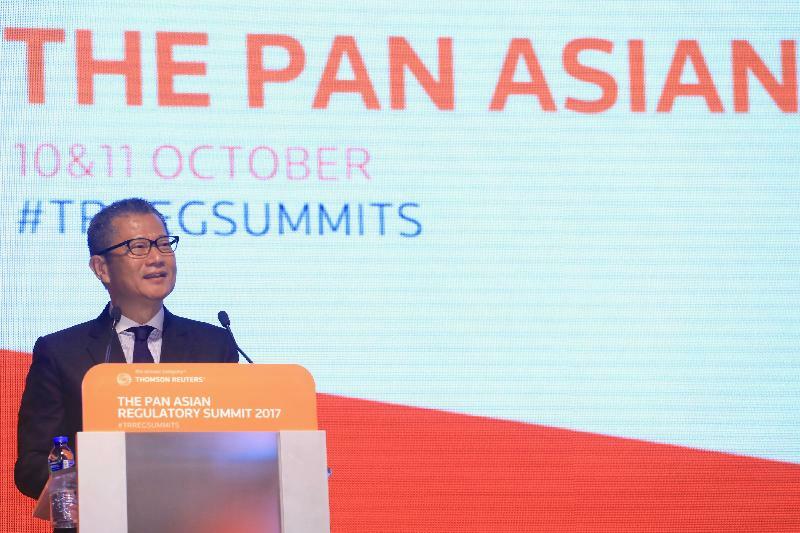 It is my pleasure to join you for this eighth Pan Asian Regulatory Summit. A very warm welcome to Hong Kong, Asia's world city and the world's premier financial centre. Governments around the world, including Hong Kong, strive to strike the right balance between regulation and risk. This is especially true of the financial services industry in our current era of rapid high-tech innovation. Accuracy as well as speed of decision-making can have a big impact on competitiveness. At the same time, we must not compromise investor protection. Regulations and international standards have evolved quickly in response to the rapid changes in the financial markets and security landscapes. Allow me to share with you some of the work we have done to develop Hong Kong's financial services by improving market quality and complying with international standards. At this Summit three years ago, a new proposal for mutual recognition of funds (MRF) between Hong Kong and the Mainland of China was a topic of discussion. The proposal was well received and the advantages are clear - MRF provides a wider choice of products to investors in both markets. Three years on, I am pleased to tell you that the Securities and Futures Commission has reached MRF agreements not only with the Mainland, but also with Switzerland last December and with France in July this year. The SFC will continue to explore similar arrangements with other jurisdictions in order to further expand our fund distribution network. To further develop the asset management industry, we have expanded the legal framework for fund structures through introducing the open-ended fund company (OFC). This regime provides market participants with more choice in establishing and operating funds in Hong Kong. Our target is to commence the regime next year, after passage of the relevant subsidiary legislation. To promote the use of the OFC structure, the Government introduced in June this year a bill on extending profits tax exemption to onshore privately offered OFCs. Once the legislative amendments are passed, all OFCs, public or private, onshore or offshore, can enjoy profits tax exemption, thereby creating a more conducive tax environment for such funds. Another hot topic regarding regulation and market development around the world is financial technologies, the Fintech. Connecting the dots between Fintech regulation and Fintech innovation is not easy. Regulation is often perceived as an obstacle to the development and application of Fintech, which thrives on innovation, change and disruption. While we all recognise the exciting benefits and potential of Fintech, and the need to create an environment for Fintech to flourish, we at the same time have to ensure that the public and investors are not exposed to excessive risk. Only then can we maintain stability and confidence in the market. What we have come up with as a solution is the sandbox approach. Last year, the Hong Kong Monetary Authority (HKMA) launched the Fintech Supervisory Sandbox. This enables banks and their partnering Fintech firms to conduct live tests of their new technological initiatives at an early stage under a controlled environment. Projects do not require full compliance with the HKMA's usual supervisory requirements. It is a safe environment for new initiatives to test the water and get advice from regulators without putting consumers at risk. The sandbox strategy has helped banks to reduce lead time required for launching their Fintech products. It has also provided them with useful feedback from consumers at an earlier stage. With the regulatory sandbox, we aim to achieve a win-win result. Building on its initial success, the HKMA has recently upgraded its sandbox with new features that enhance connectivity between banks and Fintech firms. And just last month, the SFC and the Insurance Authority have also announced the launch of their own sandbox initiatives. I would encourage industry players to make good use of these sandboxes. On the topic of Fintech, allow me to extend an invitation to you to join our signature Fintech event, the Hong Kong FinTech Week, which will begin on October 23. The event is expanded this year to showcase Hong Kong's unique qualities, Fintech start-ups and market access as well as the latest trends in Fintech development. The biggest players from around the world will be there so I encourage you all to take part. Let me now turn to the insurance industry, which is another pillar of Hong Kong's financial sector. Our new insurance regulator, the Insurance Authority, or IA for short, began operating in June this year. The IA is independent of the Government. Its goal is to support the sustainable development of the insurance industry while enhancing protection of policyholders through a more holistic regulatory system. The IA is now preparing for the commencement of the new statutory licensing regime for insurance intermediaries in about two years' time. To align Hong Kong's regulatory regime with international standards, the IA is pressing ahead with its plan to develop a Risk-based Capital requirement. This regime is going to make capital requirements more sensitive to the level of risks borne by insurers, thereby enhancing the supervisory capacity to identify, assess and mitigate vulnerabilities. We believe the IA, being operationally more nimble, will be able to cope with regulatory challenges more effectively. Meanwhile, we are also drawing up the legislation for the establishment of a Policy Holders' Protection Scheme (PPS). The PPS aims to better protect policyholders, maintain market stability in the event of insurer insolvency and enhance public confidence in the insurance industry. Similarly, we are working with the audit profession to enhance independence of Hong Kong's auditor regulatory regime. I am glad to say that the industry is supportive of this government initiative to expand the ambit of the Financial Reporting Council. The Council would become an independent auditor oversight body regulating auditors of public interest entities. We will soon introduce the amendment bill into the Legislative Council. Above all, the Government is committed to strengthening Hong Kong's position as a global financial centre. As such, we place great importance on international standards of best practice. On anti-money laundering and counter-terrorist financing, AML and CTF in short, we are proud to be an active member of the Financial Action Task Force (FATF) since 1991. To keep pace with the international standards in this highly sensitive area, the Government introduced two amendment bills into the Legislative Council in June this year. The first amendment bill concerns the codification of customer due diligence and record-keeping requirements, as well as the introduction of a licensing regime for trust or company secretarial service providers, and the other amendment bill affects the disclosure of beneficial ownership of companies incorporated in Hong Kong. These two amendment bills are part of our international obligations to combat money laundering and terrorist financing. We shall spare no effort to ensure that the AML/CTF regulatory regime in Hong Kong is up-to-date and benchmarked against international best practices. Our banks continue to meet and exceed international standards under the Basel Accords for capital, liquidity and disclosure. Notably, the banking industry in Hong Kong remains well capitalised, with a consolidated capital ratio of 18.7 per cent at the end of June; that's double the international minimum requirement. Quarterly average liquidity is also well above statutory minimum requirements. We have built a robust regulatory framework over the years to safeguard the good health of our banking system. We have successfully implemented the First and Second Phases of the Basel III standards in good time. Preparatory work is also under way for implementing some latest Basel capital and liquidity standards. These include revisions to the leverage ratio framework, capital treatment of expected loss provisions, Net Stable Funding Ratio, etc, which are scheduled for implementation on January 1, 2018. We are also amending our Banking Ordinance to bring the regulatory regime in respect of banks' financial exposure limits up to date. We are confident that these efforts will strengthen our financial system and contribute to Hong Kong's financial stability in the long run. Last, but by no means least, I would like to update you on the OTC (over-the-counter) derivative regulatory reform and the short position reporting regime. Hong Kong is committed to implementing the G20 commitments on the OTC derivatives regulatory reform, and has been implementing the regulatory regime in phases. Since July this year, the HKMA's reporting requirement has been expanded to cover all interest rate derivatives, foreign exchange derivatives, equity derivatives, credit derivatives and commodity derivatives. In addition, mandatory clearing of dealer-to-dealer trades of certain interest rate derivatives and designation of central counterparties have already commenced since September 2016. Meanwhile, in keeping with the development of short selling activities in the Hong Kong market, the SFC expanded the scope of the short position reporting regime in March this year. The regime now covers all securities that can be short sold. Ladies and gentlemen, I cannot emphasise enough the importance of collaboration between the Government, financial regulators and the industry in achieving the right balance between risk and regulation. We have made some good progress and we will continue to enhance the resilience of the financial markets while promoting market development and protecting and educating the public and investors. I have outlined some of the HKSAR Government's areas of focus and strategies for developing our financial services industry. I am sure you will be able to get more insights on our work from the keynote presentation by Ashley and David later this morning. I wish you all a successful and fruitful Pan Asian Regulatory Summit, and for those of you coming from abroad, a most enjoyable stay in Hong Kong.